Pitchfork beats raygun any day of the week. 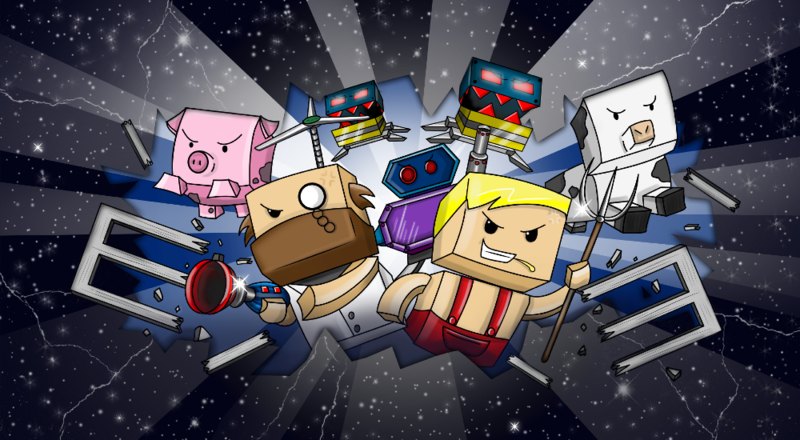 Space Farmers from Bumpkin Brothers is one half co-op puzzle solving and one half co-op arcade gaming. You'll notice both halves involve co-op, which means if you add them up the entire game is co-op! Like how that works? We knew you would. 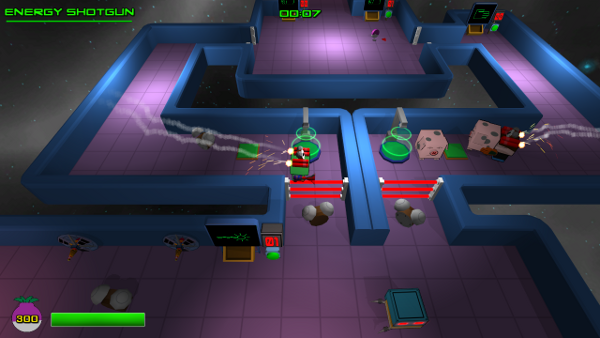 The idea behind Space Farmers is that you and a co-op buddy take control of farmers who have been kidnapped by aliens. (It happens more often than you'd think.) Now they find themselves trapped on a giant ship planning escape route after escape route in the hopes they can break free. Gadgets, cube-like robotic monsters, lasers, rolling spike things and all sorts of other traps stand between them and home, not to mention endless light years of cold, dark space. Good thing British farmers are a tough stock, even without their daily cup of tea. 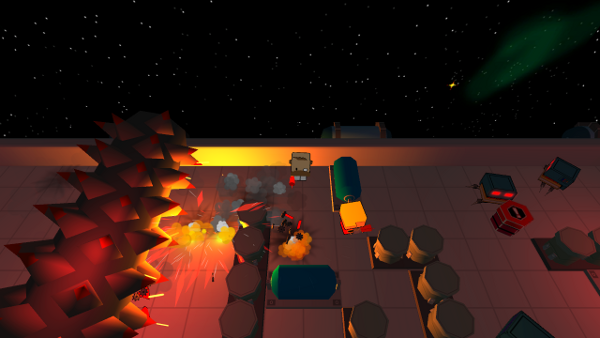 Since Space Farmers is strictly two player online co-op, you'll need to either host a game or join a match. After choosing your character's look, the farmers pick an escape route and the fun begins. Each round sends you through a handful of stages strung together end to end. Make it to the exit of one, start the next, repeat until you're back in the ship lobby area. Runs are randomized to send you through as many unseen stages as possible, but prepare to repeat areas several times before you see all the game has to offer. Level design is pure co-op bliss. Rooms tend to split players' paths and send them on quests of their own, all in the name of helping out the other farmer. One character might need to deactivate a barrier that allows the other to continue forward, for example. You'll also encounter plenty of timing-based cooperative moments, most of which are of the "hold the button so that laser doesn't kill your friend" nature. Potato Bombs and Detonator - A two-part item. One player lobs the bombs, the other detonates. Laser Cutter and Goggles - One player brandishes a pair of nifty invisa-vision goggles that shows the location of hidden land mines. Meanwhile, the other player holds an always-on laser. Hilarity ensues. Gravity Gloves - Lets you pick up things and put them in places. Like cuboid pigs on floor switches. Dynamite Hat - Tick tock until it goes boom. When it goes boom, so do you. Hover Backpack - Float over gaps like you're Superman or something. That's not a complete list of items in Space Farmers, by the way. Part of the fun is discovering new gadgets and figuring out how to use them without killing yourself. Wouldn't want to spoil that! Page created in 0.8133 seconds.